*I'm going to sew up something small for the church service auction (Sept. 1) (should I say? ok... I have been admiring Noodlehead's gathered clutch for a few months now, so I'm going to make one for one of my lucky church friends.) I just need to figure out where to fit it in with my other deadline projects. *Oh yeah! One more thing, I need to finish cutting squares to mail out to my Bee Beautiful friends as September is my month. I'd like to mail them sometime in the last few days of August. As soon as I have time, and have finished the quilt I mentioned above, I'm going to finish up my 9-patch quilt! 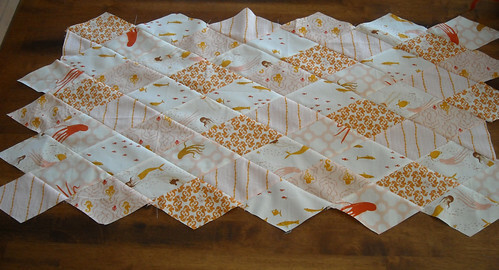 I really want to use white Kona crush fabric for the sashing and need to find a good source for it. I have sort of (mostly) decided that for a while I am not going to be buying fabrics for any new projects--I want to focus on finishing some of the many UFO projects I have laying around here. I am still trying to decide if I might need to make an exception for my birthday next month though. Whoa - you've got a lot on your plate! ANd that sham - beautifuL! 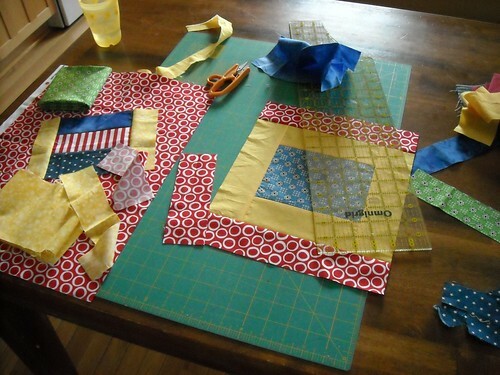 Sounds like a lot of back to school/sewing is around the corner for you;) Love those fun blocks your working on and the sham too! Wow! You're a busy girl. That is just too much fun for one post (lol). JoAnn's has Kona Cottons for $5.99 and they frequently have 50% off coupons. Gotta love that! Wow! You have a lot you're working on! Good luck getting it all done! It's just after 8am as I read your post. You young folk and your energy!!! Wow! beautiful stuff you are doing. I'm going back to bed.